I was recently going through some Paris photography tour photos when I stumbled on this picture. 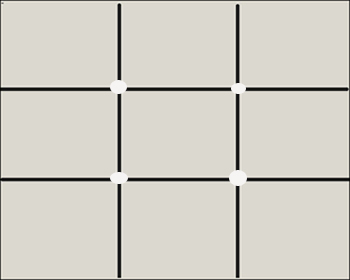 cross is known the "Golden mean point". I hope my students don't see this photo! Shooting Rome - Rain or Shine! Rome was founded over 2,700 years ago, so it’s got a lot of history. I encourage people to get away from the run of the mill, “standard” photos of monuments and look for the interesting angle, capturing Rome’s history as part of its present day fabric: looking out for the small details that many would overlook. I want the people who come on the tours to take a little time think about their photos. Try to let the photo tell a story, it doesn’t have to be War and Peace, or Charles Dickens, but a slice of an emotion that you felt which made you want to take the picture in the first place. 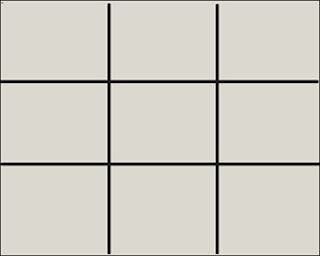 Most of all take time over composition. What are the elements that make you want to take it? And how can you bring them all together in a harmonious way so it all clicks into place? 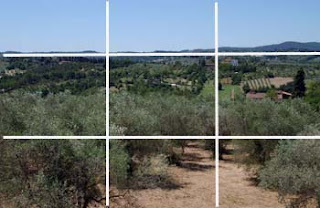 And I underline how important it is to make a decision when composing, should the photo be horizontal or vertical, and to study the relationship and positioning of the various elements to the edge of the frame. Rather than shooting casually, look around you, just a few centimetres right or left, backwards or forwards, up or down, can make a lot of difference. One one July day my client John and I not only photographed Coliseum and the Pantheon and other famous landmarks, we also photographed the violin maker; the antiques restorers workshop; the colourful market in Campo de Fiori; the Jewish Ghetto (a unique neighbourhood that feels like you have been invited into some one’s living room) two small but beautiful churches, one lavishly decorated, the other one with an interesting surprise in store. We also photographed inside the world’s oldest public library and we met a Roman artist whose studio door is itself a painting, and went inside to photograph. The day began with one of Rome's famous downpours; I was afraid John wouldn't show up, but he did - with his wife and son. 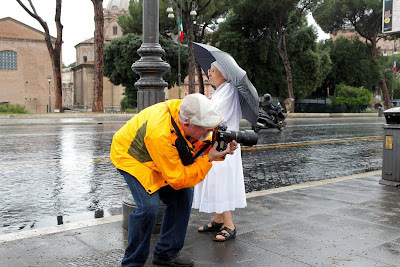 Photographing Rome (or any city) in the rain is a photographer's delight as there are many interesting (and sometimes funny) incidents with tourists running for cover. Rain also provides wonderful relflections on the cobblestones. As you can see, the rain didn't deter John from "telling his story" in photos. 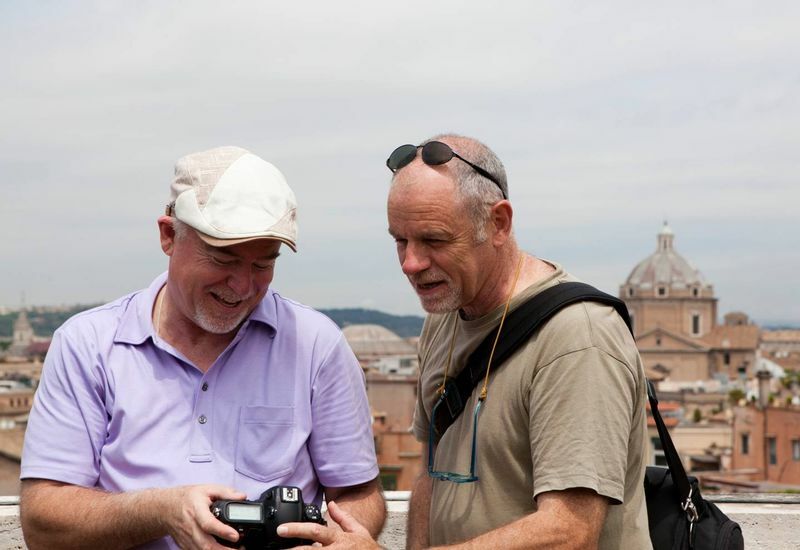 I like to show my clients the Rome that I find most vibrant – the out of the way streets and alleys which are full of history and still full of life. Rome is much like a visual sonata . . a mixture of congruous movements, contrasting tempos, keys, moods and styles. It's the ultimate movie set, made ready to photograph, day or night. Perhaps the most interesting subject to photograph in Rome are the Romans themselves. The citizens of Rome can be described as opinionated, stylish, dramatic, stubborn and publicly expressive. When observing the city's inhabitants I am often reminded of the most successful brand in history, SPQR (Senatus Populus que Romanus), . . the Senate and Roman People . That pride of citizenship may or may not be true today but I'd like to think it still holds water. A word of caution . . always ask before you shoot. Photographing people in public requires discretion and tact. The 'golden rule' . . do unto others as you would expect them to do unto you, works. I got friendly with a homeless guy Marcel. He lived on the main pedestrian way on Isola Tiberini, the Island on the Tiber. He had a dog (unfortunately paralyzed from the waist down), two parakeets, potted plants, a bicycle, a tent and he seriously called this place his home. Several thousand people walk pass this spot everyday. He was part sane and part crazy especially when he got plastered. Individuals like Marcel, who live on the edge, interest me, in part, because of the photographic potential and the stories they can tell. Marcel who looked about 60 Years old, had a hand held digital movie camera and he recorded himself in a personal diary. 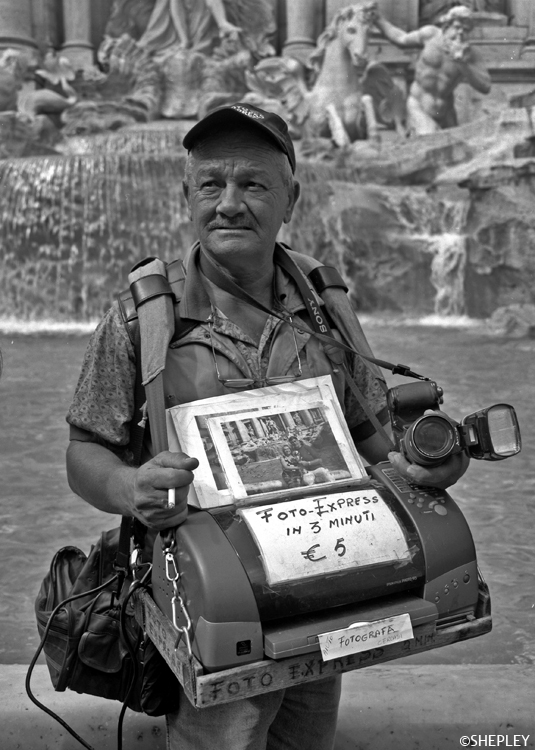 While I was visiting Marcel one day, a tourist approached him and photographed him without asking permission. Marcel picked up his movie cam and turned it on the tourist. He got in his face and hounded him for a couple hundred yards. I was seriously impressed by that and I got a good laugh out of it. To Marcel people were guests in his house. So therefor the simple courtesies we expect from others work great when they grace our own communications. But as a last resort, always have a pocket full of single Euros on hand out when the need arises. This rule is actually very simple. 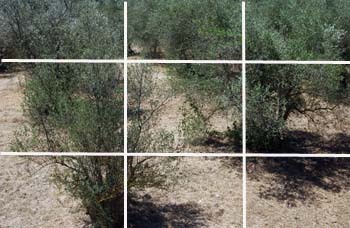 In the top photo, the tree is to the left of the center, notice how the focal points are at the lines. In the center photo, this tree is focused on the center. In the bottom photo, the same tree is on the right line. Which image draws your eye through the image? 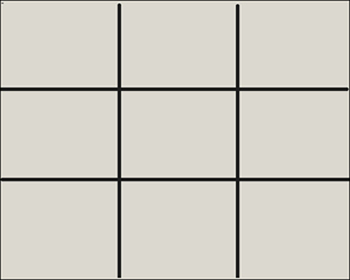 Which one looks umm sort of boring? When you center your subject, it gives the impression that something is missing, the image is not complete. 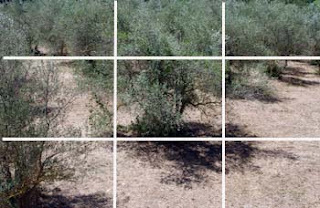 The image with the same tree on the left gives more depth to the image, and draws you to different focal points. The same tree on the right, does the same thing, only with fewer trees! 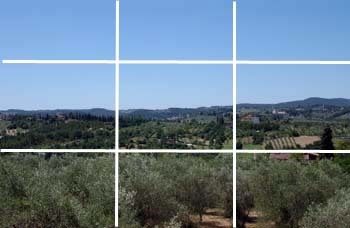 In the photo above, the horizon line is in the middle of the frame. 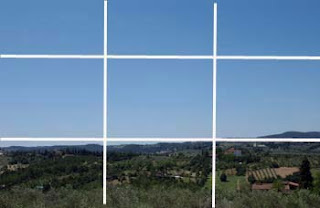 Again, when you put the horizon in the center point of the image, most of the subjects are missing the focal points, the image looks cut off and not complete. 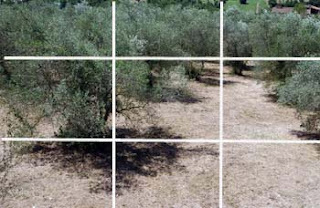 When you look through your lens, look at the focal points and imagine the lines move your camera to see which angle you like best before taking that shot! Remember, the easiest way to remember this is to "keep your horizons high or low, but not in the center!" Susan Brannon - your Photo Adventurer photographer in Florence Italy.